Remember the picture of that gorgeous baby bushbuck I posted on our Facebook page a few weeks ago? Well due to some very unfortunate circumstances the little ones mother died a few days ago… We are not exactly sure what happened to her, but it is heart breaking she is gone. Especially for my neighbour who found her. 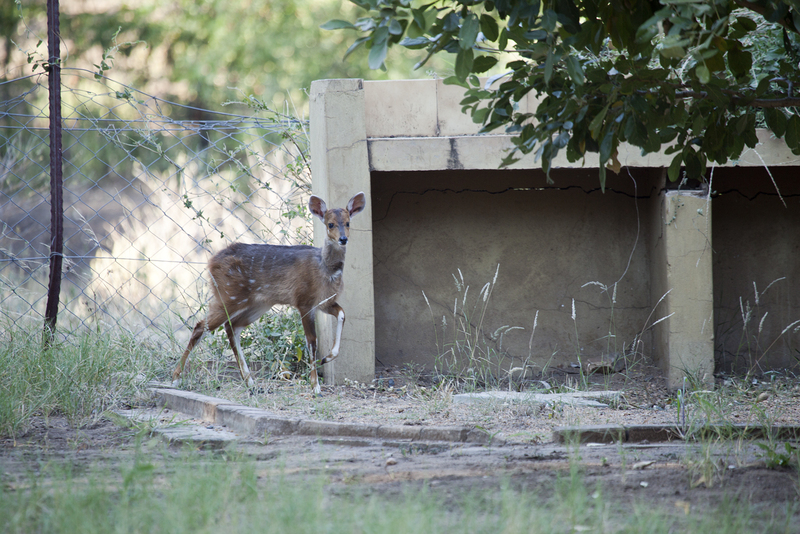 Little bushbuck is now an orphan. It is still so small and I am sure it misses its mother terribly. We all felt so sorry for this tiny fawn. We got quite attached to it in the weeks we have seen it around. The first instinct for the staff village neighbours was to help the little bushbuck. See if we could catch it and if it could be hand reared. But this is where a bit of a dilemma comes in. First of all, we are not supposed to interfere with nature. Also, if we have the baby’s best interest at heart, are we going to do it a favour by trying to catch it? With all the stress that involves? Will it survive the stress of being darted and then confined to a garden or a holding pen? Will it ever get so used to humans it won’t be able to go free? It has been living with its mom and without human interference since it was born. But then again, is it going to survive on it’s own? The mother gone that it was relying on for protection, food and warmth. We chatted to our section ranger about the bushbuck baby. It is probably best not to put little one through all of that stress. Not unless it is struggling to survive on its own. After what happened to its mom, the little bushbuck disappeared for a day or two. We have all been keeping an eye out for it to see how it is doing. I find myself peering out the window and try get a glimpse every chance I get. I saw it yesterday and it appears to be doing fine. Lets hope we get to see it grow into a beautiful adult! Oh how we get attached to the wild animals we should not get attached to…. That’s nature and it can be tough. Nature can be cruel indeed. Never nice to see, but part of where we live! Poor baby. Hopefully it had been weaned and is able to feed itself. The natural cycle of life is not always attractive to those of us who love animals, but it does function best when left alone and not interfered with by us humans; very hard to do! That is life…survival of the fittest. It seems harsh to us, because humans have this need to control things, but nature knows best. Problem is that those Letaba bushbush are really tame, and used to humans. Hope the little one survives on its own. Hi Wendy! Luckily the staff village is a few kilometres from the rest camp and our bushbuck are a lot more wild!